A lifelong friend and trusted aide of Ulysses S. Grant, Ely Parker rose to the top in two worlds, that of his native Seneca Indian tribe and the white man's world at large. 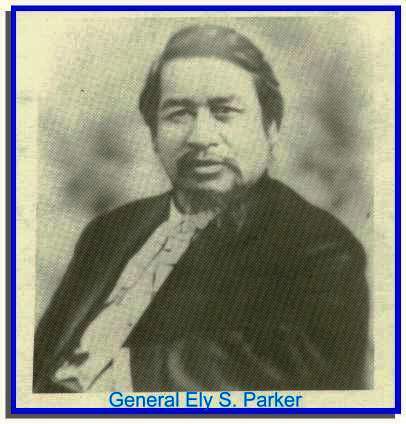 Ely Samuel Parker, Seneca Indian, engineer and soldier, was born near Indian Falls, NY in 1828. Educated at the Baptist Mission School of Tonawanda and at Yates and Cayuga Acadamies, his early adult years were spent working for the welfare of his people. He studied law but was refused admission to the bar as he was not considered a citizen. He studied engineering and while working on a government project in Galena, Illinois, he met U.S. Grant. When Parker first tried to enlist in the Union army he was rejected because he was an Indian, but he was finally commissioned a captain in the engineers. When Grant became commander of the Union forces, he requested that Parker be appointed to his staff. Parker was present when Lee surrendered at Appomatox and the surrender documents are in his handwriting. After exchanging small talk, Lee and Grant began drafting the articles of surrender for the Confederate army. Once the generals had agreed on conditions, Parker was directed to copy the articles of surrender for signatures. Although Ely Parker is best known for his role in drafting the terms of surrender that ended the Civil War, his life's work was far greater than that single act. He attained the rank of brigadier-general and during Grant's presidency, served as Commissioner of Indian Affairs. He is buried in Forest Lawn Cemetery in Buffalo.